Seventy-three years ago this month, a new kind of fictional hero made his debut and popular culture hasn't been the same since. The hero was Siegel and Shuster's Superman, and although he was not the first costumed hero, all others before him (and most since) pale in comparison. Within a year or two of Superman's debut in Action Comics #1 (dated June 1938, but on the newsstand for a couple of months prior), dozens of comic book companies had popped up, mostly in New York City, each trying to repeat the success National Periodicals had with its Man of Steel. Those companies and the studios under their employ created hundreds of costumed characters--superheroes, mystery men, phantoms, super soldiers, detectives, aviators, jungle girls, spacemen--most of which flopped and have seldom been seen or heard from since. After World War II, superheroes themselves fell on hard times. During the 1950s, comic books came close to extinction. Many comic book companies gave up the ghost, while artists and writers were forced to go looking for work elsewhere. No one gave any thought to renewing the copyrights or trademarks for hundreds of characters and titles, or of thousands of stories. Consequently, those characters, titles, and stories fell into the public domain. They are free now for use by anyone, without permission, licensing, fees, or even attribution. There are no copyright violations or trademark infringements associated with their use and reproduction. Thus was born a new kind of character: the Public Domain Hero. Five Star Comics began with the idea of reviving not only the characters of the Golden Age but also the the spirit of the 1930s and '40s. Too often today, comic books are grim, negative, gratuitously violent, and nihilistic. So-called "heroes" are not heroic or even admirable in any way. Many are simply psychotic killers. Golden Age heroes were different. They were aware that there really is a difference between good and evil. Golden Age heroes knew where they stood: It was on the side of right. So how did we find the characters for our stories? Few people today can afford to search through hundreds of Golden Age titles for just the right character. Fortunately, there are several websites devoted to characters in the public domain. The men and women who have compiled the information on these websites have done a lot of work. We should all thank them for it. They have made it possible for us, the creators, to tell new stories about old characters, and they have made it possible for you, the readers, to enjoy those characters once again, after all these years. Public domain characters offer a lot of opportunities to artists and other storytellers. You might want to give it a try. As for Five Star Comics, look for the first issue this summer! Five Star creator Terence Hanley will be at the Summit City Comic Con in Fort Wayne, Indiana, on Saturday, June 18, 2011. This will be his third convention as an artist and the first of at least three conventions he will attend this summer. In addition to selling his Mothman, Aliens, and Flying Saucers and Monsters and Aliens of America Coloring Books, Terence will draw pictures of your favorite monster, alien, creature, or beast, and he'll have a coloring page giveaway showing the most famous monster from the Fort Wayne area, Oscar, the giant turtle, otherwise known as the Beast of 'Busco! The Summit City Comic Con is a one-day event taking place at The Grand Wayne Center, 120 West Jefferson Boulevard, in Fort Wayne, Indiana. Event hours are 10 a.m. to 6 p.m. You can find out more at the convention's website, here. Mothman, Aliens, and Flying Saucers! Available at Summit City Comic Con in Fort Wayne, Indiana, this weekend. 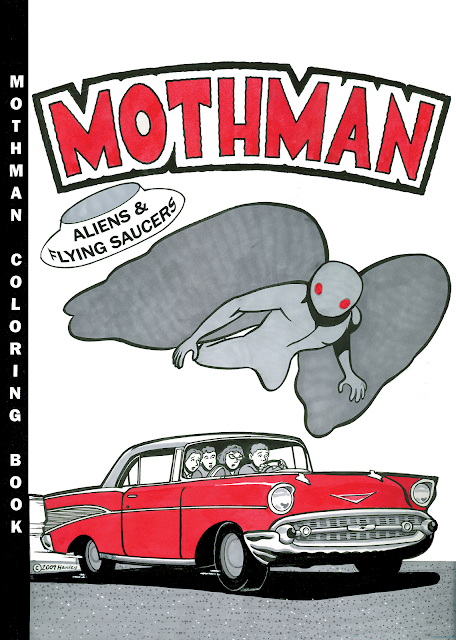 Cartoonist Terence Hanley broke into small press with his own self-published coloring book, Mothman, Aliens, and Flying Saucers. 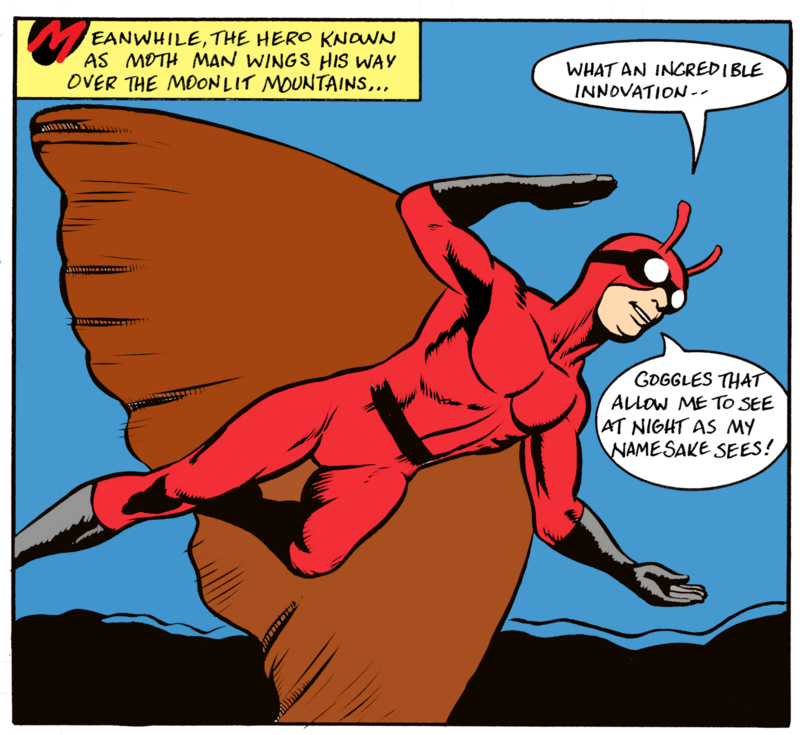 Now he's bringing Mothman to Five Star Comics, where Mothman the creature will meet Moth Man the Golden Age hero for the first time. Terence's story, "Moth Man Meets Mothman," begins in the mountains of West Virginia and ends at a place everyone remembers as one of calamity. Look for Mothman and Moth Man in the first issue of Five Star Comics, coming soon! Larry Blake has been drawing small press comics for almost forty years and has been writing and drawing comics since at least 1960. Now he's on board with Five Star Comics. In his first story, "Yesterday and Today," Larry will bring Silver Streak, a popular Golden Age character, back to life and into the 21st century. And who does Silver Streak meet but his own great granddaughter, a new character and new heroine named Missile. If you have read Larry's long-running Psychozort and Kevin Cool, you'll like "Yesterday and Today." The character, name, and concept of "Missile" are the property of Larry Blake. All rights are reserved.